The exchange of documents in the PDF format is a sign of consideration. Converting documents from different documents to PDF format gives you the ability to email documents to customers in change-protected mode, to replicate presentation materials in printshops without any troubles with missing fonts or broken layouts. Plus, converting documents from different documents to PDF allows you to prepare them for archiving. 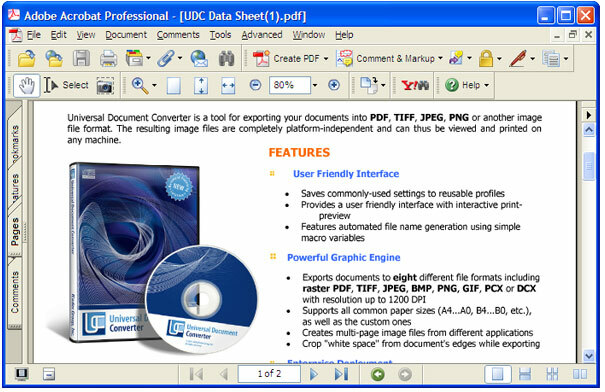 Universal Document Converter is the most complete solution for the conversion of documents into Adobe PDF or graphical files. The underlying basis of Universal Document Converter is the technology of virtual printing. As a result, documents to PDF format is not any more complicated than printing on a desktop printer. Open the document in Microsoft Word and press File->Print... in application main menu. Q1: I need to convert text-only documents to PDF format. How can I reduce the size of the PDF file? 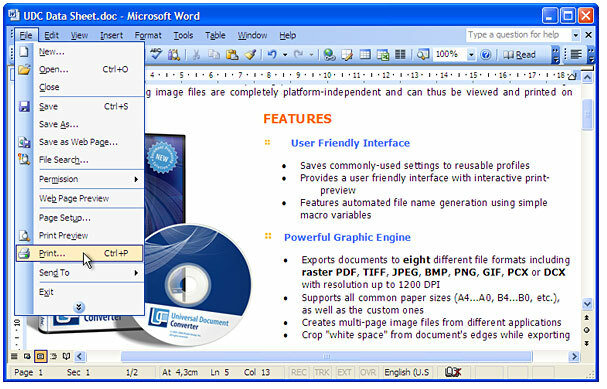 Q3: How to append all Word documents I have to one multipage PDF? A3: Please open the Output tab in the Universal Document Converter Properties window. Select Append all pages to existing PDF file in Options drop down in bottom part of the window. Q4: How can I keep the background color or background image when I convert a document from Word to PDF? A4: Please press File-Print... in Microsoft Word main menu. In Print window press the Options... button. Enable the Background colors and images check box in the middle-right area of the window. Q5: I need to convert daily about 150 documents from Word to PDF. How can I automate this task? A5: PrintConductor software can print Word documents in batch mode. 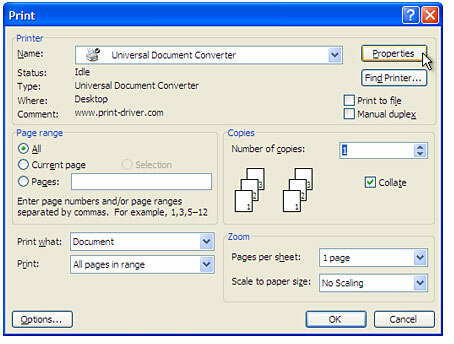 If you select Universal Document Converter from the printers list, PrintConductor will use it for converting documents from Word to PDF instead of printing them on desktop printer. Q6: I need to convert Word to PDF myself using VB.NET. Do you have any examples? A6: Yes, you can find source code examples for Visual Basic and Visual C++ in Developer Solutions section of Universal Document Converter’s site.